Scale model thatched roofs can be created from a number of materials. Depending on the scale you need, you can use anything from coir fiber to toweling, aluminum foil or wire brushed basswood or balsa wood. Pick a method and see what you can come up with for your next thatched roof project. Coconut fibers or rolls of coir make the most authentic thatch on scales from 1:24 to 1:6. Earth and Tree Miniatures have an excellent tutorial featuring the rolls of coir fibers they sell, which are easy to manage and can be glued down in small bunches using PVA glue. 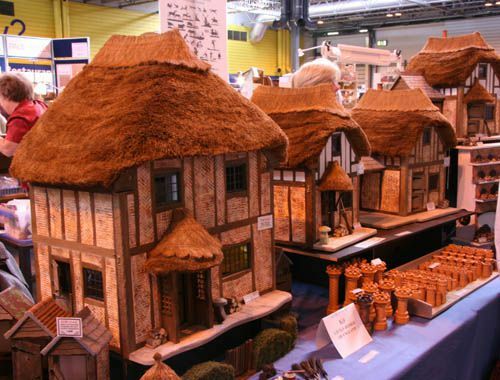 You can also find a similar method of thatch outlined in Brian Long's book The Authentic Tudor and Stuart Doll's House. You will need sturdy kitchen shears to trim the thatch to shape. The only disadvantage of coir fiber thatch is that it tends to have a reddish cast rather than the grayed straw look of real rush thatch. You can shift the color with paint, or a vinegar weathering method. John Constable, author of Landscapes in Miniature uses sets of 4-inch bristles from a broom head to thatch the roughly 1:24 scale cottages for his miniature living landscape scenes. This method is similar to the one using coir or coconut fibers, as many fine brooms use these fibers. His book outlines the method clearly, as do his articles for Dolls House World Magazine between June and November 2004. Scale Model Thatch Made From Wire Brushed Balsa or Basswood. Balsa wood or Basswood can be scored with a wire brush to give the effect of thatch in several miniature scales. This is a technique often used by Rik Pierce for workshops. The wire brush technique works with both a handheld stiff wire brush (usually used to clean metal) or a large, powered wire brush head on a rotary tool often used for stripping paint or removing rust. The brush should be drawn down the grain of the balsa or basswood, and you must take care not to gouge the wood too deeply as you use the brush to loosen the surface fibers. This method works for scales from 1:12 to 1:48, depending on the size of the brush used and the thickness of the wood. Faux Fur / Fun Fur coated with a sealer or varnish can create surprisingly authentic looking thatch in scales of 1:12 and 1:24. Erin Conner - DeSilvey used it here on a 1:12 scale tobacco shop and the technique is clearly explained in Dereck Rowbottom's book Miniature Doll's Houses in 1:24 scale. A brown or tan faux fur can be spray painted with varnish and the fibers brushed into place to make an easy to apply faux thatch. A number of Asian suppliers, markets, and dollar stores sell inexpensive hand brooms made from stitched rolls of fine palm fibers. These can be used for thatched roofing by removing the stitching and unrolling the fronds, gathering them into groups and gluing then trimming them similar to the method used for coconut or coir fibers. These hand brooms have finer, softer fibers than the coir bundles, which allows them to be used for more realistic thatched roofing in smaller scales. 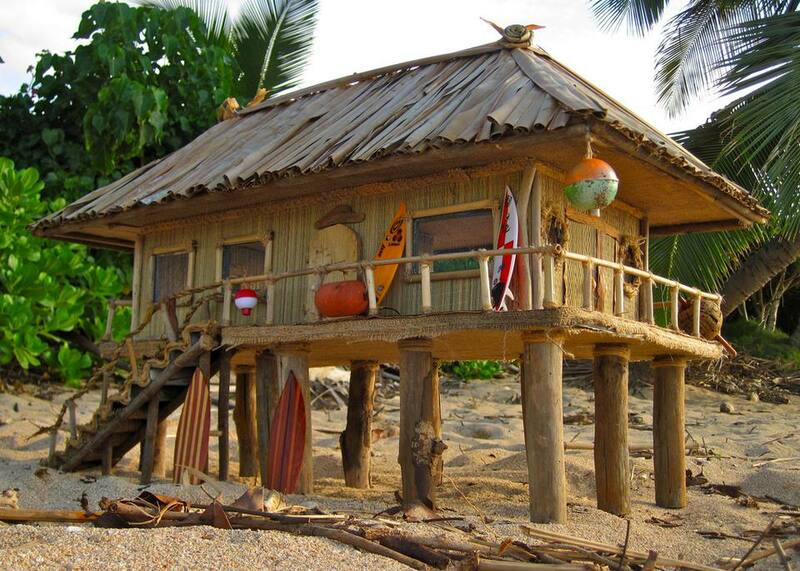 For smaller scale buildings, cotton toweling and towel bathmats can be used for a simple loose thatch effect. This method does not give the thick layers of traditional thatch but does give a good texture for smaller scale roofs, working well for 28mm or 1:48 scale buildings. Ornamental dried grasses with fine stems can be used for thatch for houses. Choose grasses with fine stiff stems and make sure the grass is thoroughly dry before you attempt to use it as thatch, using the same method outlined for broom straws or coconut (coir) fibers. Hirst Arts use a glued on layer of aluminum foil textured with a metal toothed comb to make a thatched roof effect for their 28mm (roughly 1:48 scale) building 'Dragon's inn.' The aluminum foil can be textured in sheets and a backing of PVA glue applied to hold the 'thatch lines' then apply the foil roofing, (see the information on techniques for embossing foil and paper or you can glue the aluminium foil to the roof of the building and use a comb to create the thatch lines in the aluminum before the glue dries. Once dry, the foil can be painted to create the look of thatch. What Should You Use to Build a Dollhouse or Model Building? Should You Add Dolls to Your Dollhouse?